Even to this ancient aspen forest. 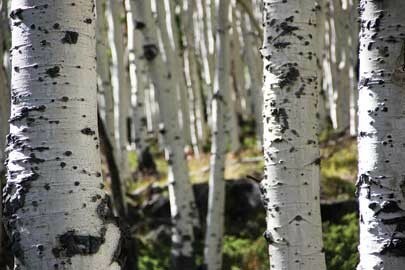 It cannot be known for certain—not by any tool or trick of today’s science, at least—but this unified colony of aspen trees might be the oldest living thing on the planet. It is also the most massive known organism in the world. Clones—as singularly genetic, interconnected aspen woods are called—spread below ground, crawling just beneath the surface of the terrain through a unified root system, stretching out for water, reaching up for sunshine. As they do, they grow. Sometimes they grow to be an acre; occasionally, they get as large as two. Over time, an entire colony can migrate from one place to another as it seeks better soil and exposure to the sky. Sometimes, in the midst of this long, slow journey, a part of the clone can become separated from the master colony by a landslide, fire or human intrusion. But, like conjoined twins split by a surgeon’s knife, the parts remain genetically identical to the whole. It’s possible that’s what happened to this clone—a highway runs right through the center of this colony. If so, the separated twins would still likely be the first-and second-largest organisms in the world—that’s just how big this behemoth is. 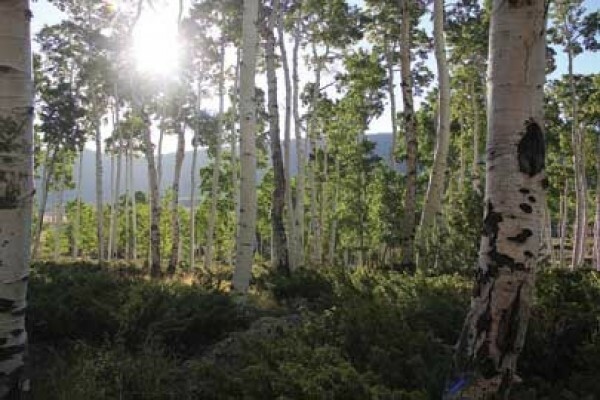 Nestled alongside Coots Slough, near the southwest corner of Fish Lake in Utah’s Sevier County, this aspen clone spans more than 430,000 square meters—more than four times the size of New York’s Yankee Stadium. And deep in this hundred-acre wood is a mystery that scientists are now rushing to solve. What is killing this great and ancient thing? And can it be stopped? There will certainly be more important things for the Utah State Legislature to consider when its members return to Capitol Hill in early 2014. But among the first pieces of legislation the body is likely to debate is a proposal to adopt the quaking aspen as Utah’s state tree. Since 1933, Utah’s tree has been the blue spruce—the Colorado blue spruce, to be precise. And each year, when they learn this, the students in Angie Blomquist’s fourth-grade class at Monroe Elementary School laugh at the absurdity. This year, the class decided to do something about it. And as it happened, a member of the Sevier County Board of Commissioners named Gordon Topham had also been thinking it was time for a change in the state tree. With a little political pull and a bit of good timing—the Rocky Mountain Jamboree was coming up in nearby Richfield—Topham arranged for Blomquist’s students to make their case to Gov. Gary Herbert, who would be addressing attendees at the festival for ATV enthusiasts. Pulling leaf-shaped pieces of paper from a potted tree, the children recited facts about aspen. The children’s pitch won the governor’s support for legislation drafted by then-Rep. Spencer Cox, R-Fairview, recently named as Herbert’s lieutenant governor. It will be sponsored in the Senate by Ralph Okerlund, R-Monroe, whose district includes Fish Lake—and whose granddaughter’s name is Aspen. 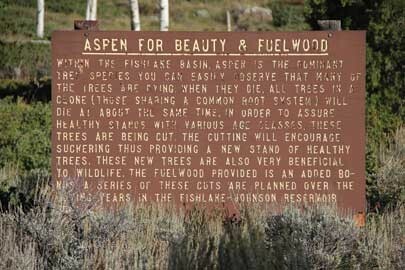 If the effort succeeds, some scientists hope, it might open more resources for protecting the Fish Lake aspen colony. And if that happens, it will have been a long time coming. It was a University of Michigan forest ecologist named Burton Barnes who first suggested that the Fish Lake clone might be a single, unified organism. Using aerial photos and comparing the patterns of its leaves and bark, Barnes drew a 107-acre perimeter around the colony on a map and published his report in a Canadian scientific journal in 1976. In findings that were mostly lost to obscurity, Barnes had laid the foundation for claiming the discovery of the world’s largest organism. But superlatives aren’t often scientifically helpful. By definition, they’re outliers. And Barnes appears to have been reluctant to make a big deal of his big forest. He had nonetheless drawn the attention of other researchers—including some who would come to see that preserving these woods might help ensure the longevity of many others. The ages of most trees, even the very old, are relatively easy to determine. And just about everyone knows how to do it. It starts with a clean cut across the waist, like arborist seppuku. Once the rings are exposed, the counting begins. With some scientific caveats, each ring represents a year. Special augers, called increment borers, are used to extract long, cylindrical core samples by researchers who don’t want to cut down the trees they’re aging. That doesn’t always work out, though. 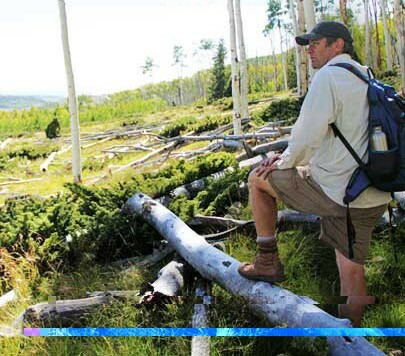 In 1964, a University of North Carolina graduate student named Donald Currey broke two expensive borers trying to age a Great Basin Bristlecone Pine near Wheeler Peak, just south of Highway 50 near the Utah-Nevada border. It was only after U.S. Forest Service officials helped Currey cut down the tree and started counting the rings that anyone realized that they’d killed what was then thought to be the oldest tree in the world. “Prometheus” was nearly 5,000 years old, meaning it had come into being right around the founding of Troy. Currey would go on to become a popular and influential teacher and researcher in the geography department at the University of Utah, but he carried the ignominy of what he had done all the way to his death in 2004. At least two other subsequently discovered bristlecone pines—perhaps as old and possibly older than Prometheus—are purportedly alive and well in California’s White and Inyo Mountains; their exact locations are a rather closely guarded secret. The irony is that Prometheus was not well known until it was destroyed. And the hidden pines— including one named Methuselah, for the figure from Hebrew scriptures who is said to have lived longer than anyone else in history—are largely unprotected from those who might do them harm every bit as carelessly as Sewell suggests.